The human rights organization, Amnesty International, marks Banned Books Week (September 26- October 3, 2009) by reminding us that in some parts of the world, the price for freedom of expression is the loss of personal freedom. Librarians generally note the week with displays of books targeted for removal from school and public libraries by would-be censors. While this is a serious matter, it in no way compares to the restrictions placed on controversial books and authors worldwide. 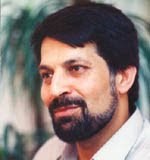 Iranian writer Emadeddin Baghi. Mr. Baghi is the author of more than 25 books, six of which have been banned in his homeland. But censorship has been the least of the consequences he has faced for expressing an opinion contrary to that of those in power. The author first went to prison in 2000, when he was given a three-year sentence for “attacking national security” by writing about the killing of dissident intellectuals in the late 1990s. After his release in February 2003, he founded the Society To Defend Prisoners’ Rights. Detained at Tehran’s airport in October 2004 as he attempted to travel to New York to receive the Civil Courage Prize, an award given for defending human rights, his passport was confiscated and he has since been unable to leave the country. On December 26 2007, while in solitary confinement in Tehran’s Evin prison, Baghi suffered a seizure. He was hospitalized, and suffered a second seizure. He was returned to prison the following day. In January 2008, he was granted medical leave for hospital treatment until April, after which he suffered yet another seizure, as well as a heart attack, in his cell. Released from prison on October 5, 2008, Emadeddin Baghi continues to be an advocate for civil liberties in Iran. He now faces new charges relating to his criticism of the treatment of other human rights defenders who have been imprisoned. Mr. Baghi's story is far from unique. Amnesty International's website details many similar stories of the repression, harassment, and imprisonment of writers who have the courage to express unpopular or forbidden ideas. Most of us would be unwilling to risk such grave consequences in defense of freedom of speech. The bravery of these authors in defending the written word reminds us of the importance of preserving the ability to write and publish material that challenges the tyranny of those who rule by fear and intimidation.